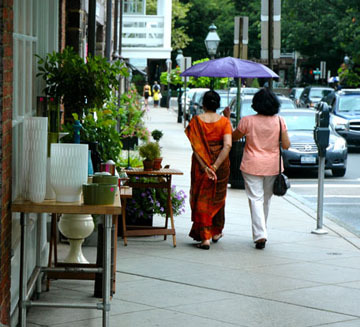 STROLLING: Last weekends Summer Sidewalk Sale on Palmer Square featured sightings of the occasional umbrella as the area got some much needed rain. Comments from storeowners on the health of the local economy are featured in this weeks Town Talk. Commuters and area residents can breathe a sigh of relief now that Mercer Street is open again. The roadway reopened to vehicular traffic last Friday at 3 p.m., just over six and a half months after work began. The proposed plan has the potential to be a model of environmentally sensitive development for the municipalities, and to showcase by example how to build in a way that is minimally invasive to the environment, said Princeton Environmental Commission (PEC) Chair Matthew Wasserman in a recent memo sent to Director Lee Solow and members of Princeton Township Committee and Borough Council. We commend the Recreation Department for its efforts to use the most efficient pool equipment available, noted the memo. Princeton University Professor of Mathematics Elon Lindenstrauss has been awarded a Fields Medal, considered to be the most prestigious honor in the field of mathematics. Princeton High School (PHS) Senior Zaid Smart was expecting to work at the public library or as a summer camp counselor when he found out he would be participating in the Human Services Department-sponsored Summer Youth Employment Program. Instead, I got a notice saying Id be in the facilities office, he said. The new, spiral-bound 80-page glossy guide, Farm Markets of Central New Jersey, has Mercer, Middlesex, Somerset, Monmouth, Hunterdon, and Burlington Counties covered, but if detailed descriptions of where to buy locally grown fresh fruits, vegetables, meat, poultry, dairy products, and wine in Central New Jersey arent enough, those who buy the guide can take satisfaction in knowing that their $10 purchase will benefit New Jersey Farmers Against Hunger. Upon joining the Princeton University womens open rowing team in the fall of 2007, Michaela Strand latched on to some good role models.